With all the UFC 153 madness that has gone down over the past couple of days, let’s not forget “UFC 152: Jones vs. Belfort” still has to come first. To help steal the spotlight back, the planet’s most prestigious mixed martial arts promotion has released a nine minute and 19 second promo video to hype their September 22nd event. The show takes place inside Air Canada Centre in Toronto. 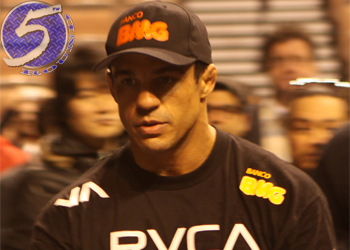 Light heavyweight king Jon Jones defends his throne against Vitor Belfort (Pictured) in the night’s featured attraction. Joseph Benavidez and Demetrious Johnson battle in the flyweight finals to become the Octagon’s first 125-pound championship in the co-main event. As if that weren’t enough, a critical middleweight shootout with Michael Bisping and Brian Stann gets third-to-top billing.